When I saw this recipe, I was immediately intrigued. It sounded delicious! When I started scanning the ingredients, I noticed it called for canned salmon. Well, I have never even eaten canned salmon, let alone cooked with it. But these looked so tasty, I figured it was the prefect time to try! When I find recipes on blogs, I usually read the comments on the post to see if anyone has made any suggestions for making the recipe even better. On this particular post, there was a bit of a debate going on as to whether or not the bones in canned salmon bother people. Wait, wait, wait… bones? Ok, well, sardines and anchovies have bones and I like those. So I was picturing tiny little pin bones and decided that would be just fine… a little extra dose of calcium. Well imagine my surprise when I opened up my first ever can of salmon, looked inside, and found rather large, creepy, round vertebrae (in addition to the pin bones). I am not going to lie, I was freaked out. I considered scrapping the whole dinner and feeding the creepy fish to the cat, but she was still woozy from being put out at the vet that day and had zero interest in eating (a rare occasion). So onward I marched. And I’m glad I did. Because the end result was pretty darn tasty! Luckily, the bones were pretty easy to remove. So I took them all out and got to work. If I haven’t totally turned you off from these, you should too. I promise they are delicious and the salmon really isn’t as bad as I am making it out to be… I was just… surprised. Preheat oven to 400 degrees. In a mixing bowl, combine all ingredients through Parmesan cheese, and mix well. Coat both sides of mushrooms in olive oil and place them upside down in a baking dish coated with more olive oil. Equally distribute the salmon mixture between the mushrooms, forming a mound inside each mushroom cap. Sprinkle with extra Parmesan cheese. Bake 25 to 35 minutes (20 to 25 for the little guys) or until the mushrooms are tender and the cheese has browned a little. The mushrooms turned out great! 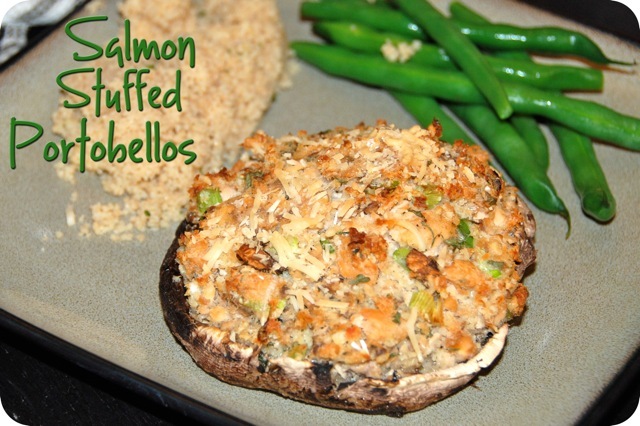 The strong flavors of the salmon and Parmesan were mellowed out really well by the portobello base. I had a big one… and then several small ones. I had to actually stop myself from eating more because they were so good. Nick really liked them too, which I consider a huge success for a meal in which the star ingredient is not meat! So would I use canned salmon again? The short answer is yes. 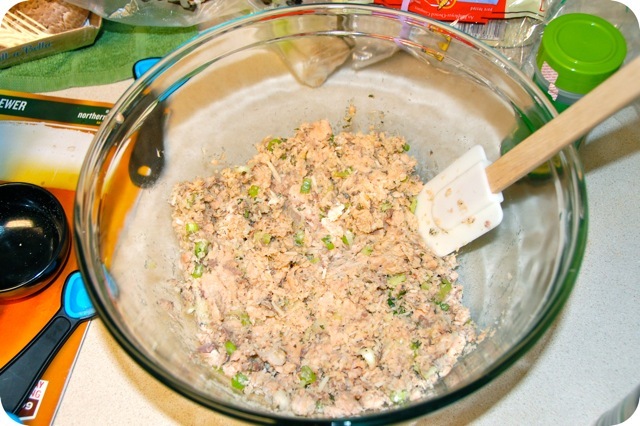 After a little more Google research, I discovered that there are lots of people who actually love the chewy texture of the bones (chewy because they cook the salmon in the can and the bones soften). I don’t think I’m quite there yet. However, I also discovered that for a few dollars more you can buy a few brands of boneless canned salmon and that sounds like the perfect solution to me! Think I could just use poached salmon instead of canned? Thank you so much Jess! 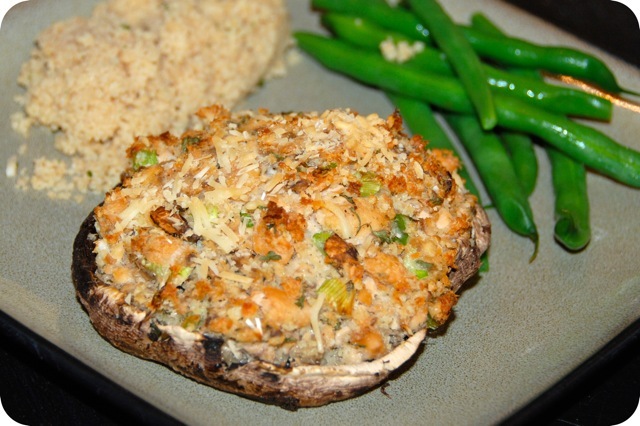 I made your Salmon-Stuffed Portobello Mushrooms last night. My boyfriend and I loved them!Very filling and quite the meal! Used fresh salmon, pan seared, got skin crispy, stopped a few minutes before fish cooked all way thru, and then implemented this into recipe.. 1000x beter n that canned slimy full o bones stuff.